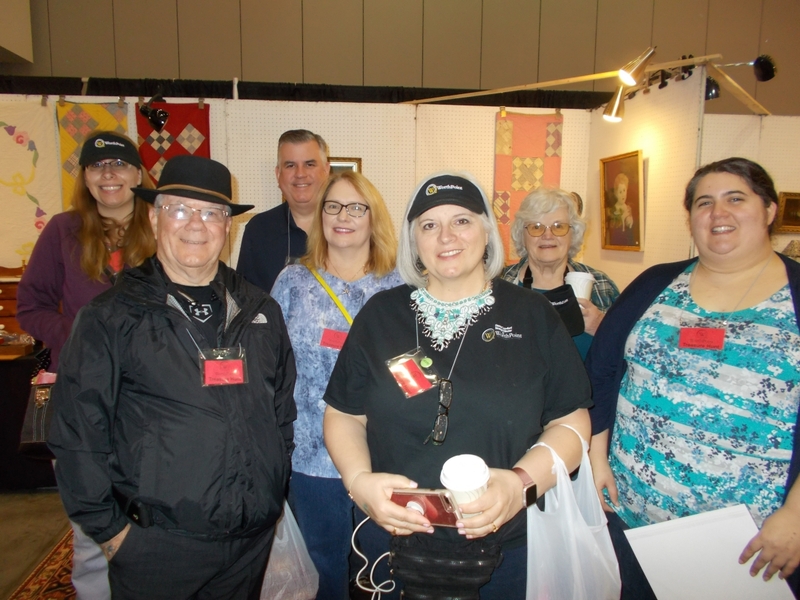 Daryl’s Neat Stuff, Chesapeake, Va.
HAMPTON, VA. – D’Amore’s return to Hampton Roads proved to be a success with a 150-booth affair at the Hampton Convention Center and several thousand shoppers for the two days, March 30-31. Joan Sides, the founder and owner, was very pleased with the results and said, “We had a good group of exhibitors from the area and region, offering early antiques, vintage collectibles and fine jewelry for the weekend that was well appreciated by the shoppers!” She added that the beautiful weather over the weekend might have had shoppers at the nearby beaches, but they did come to the show in very good numbers, investing in the collections offered by the exhibitors. Cherry Hill Liquidators, Inc, Cherry Hill, N.J., was having a good time for the weekend. 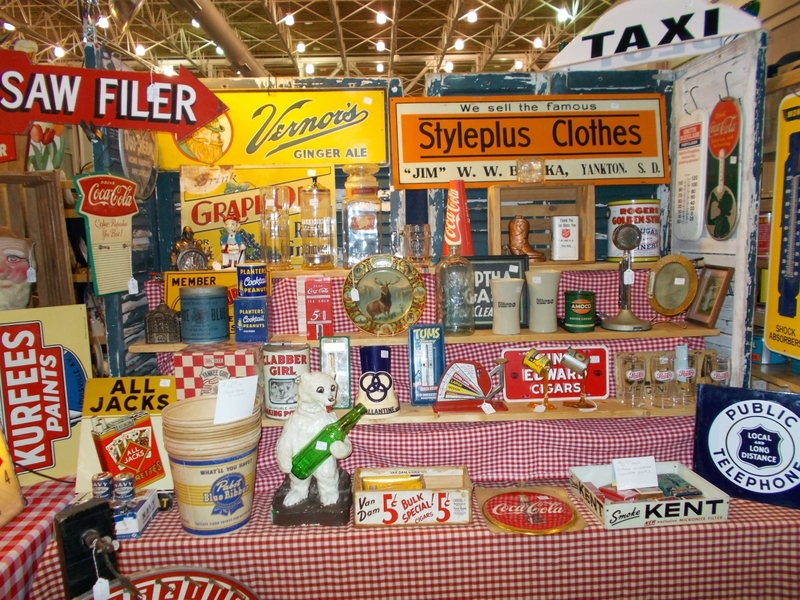 Josie Dillon, the owner and manager of the business, had an especially large exhibit area that she filled with several room settings and showcases. From this exhibit she sold a circa 1900 French Provincial-style desk complete with electrified sconces, as well as a tall secretary of similar style. 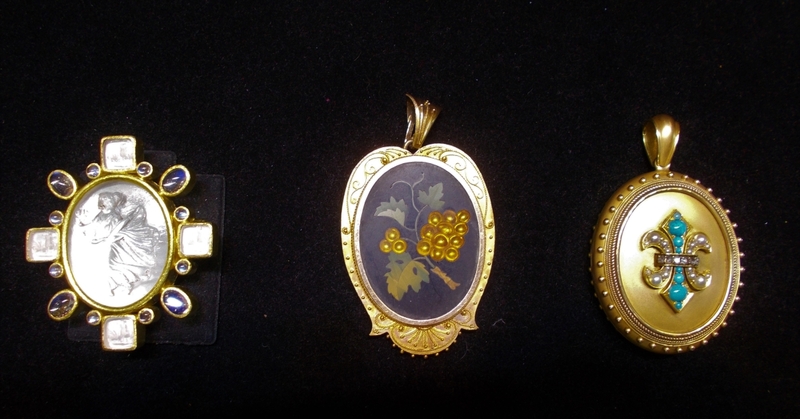 Dillon also sold a large assortment of precious and semiprecious pieces from her jewelry cases. 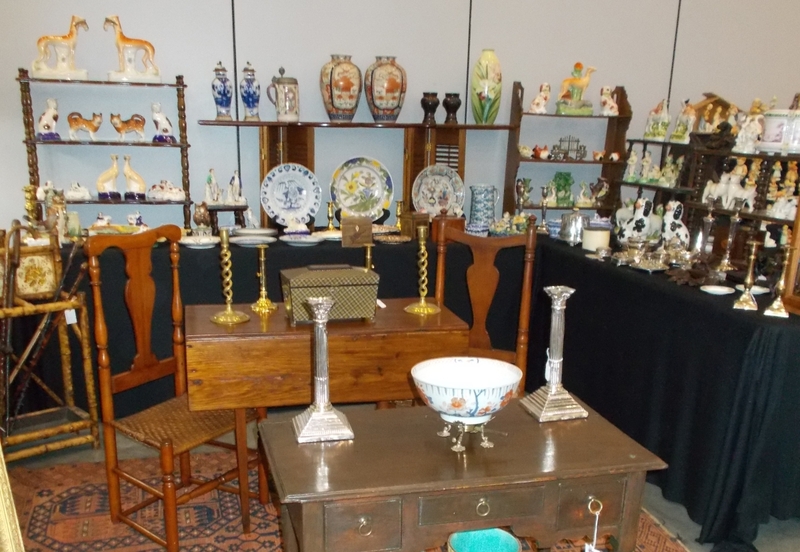 Brills Antiques, Newport News, Va., was there with Eighteenth Century American and English furniture and associated accessories. Having a nearby shop for many years, this show gave them extra advertising as well as good sales. Offerings included a George IV mahogany sideboard, which received a great deal of attention along with many of the Chinese ginger jar lamps they displayed. Peg Lockwood, Peg Lockwood Antiques, Zuni, Va., travels to England a few times each year to shop for her collection, which is focused on small pieces. She sold many of them at the show, including several Eighteenth and early Nineteenth Century rosewood and mahogany tea caddies, brass and Old Sheffield plate candlesticks from the same time period and several oil on canvas paintings. Hummel figures are about the only product Steve Cordes offers. 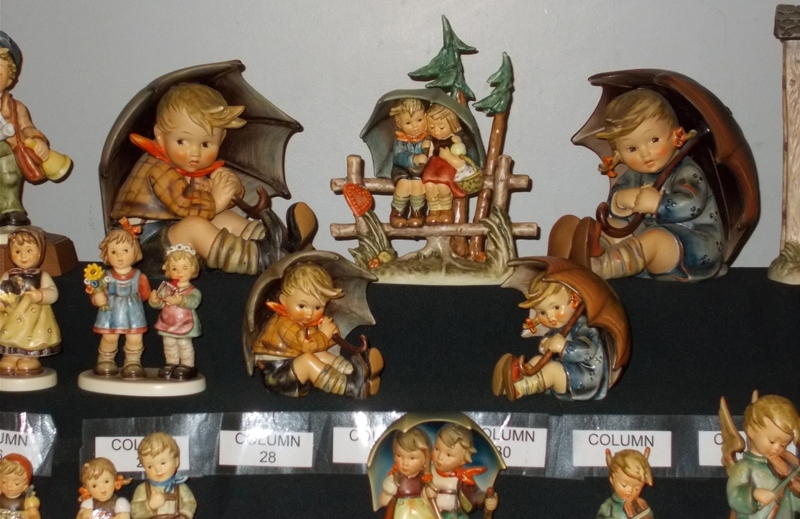 The Latrobe, Penn., exhibitor has said he has perhaps the largest inventory of these little statues of any dealer, and he arranges them so that if a collector is looking for something special, he can go right to it. Daryl’s Neat Stuff, from nearby Chesapeake, Va., was a happy camper for the weekend. 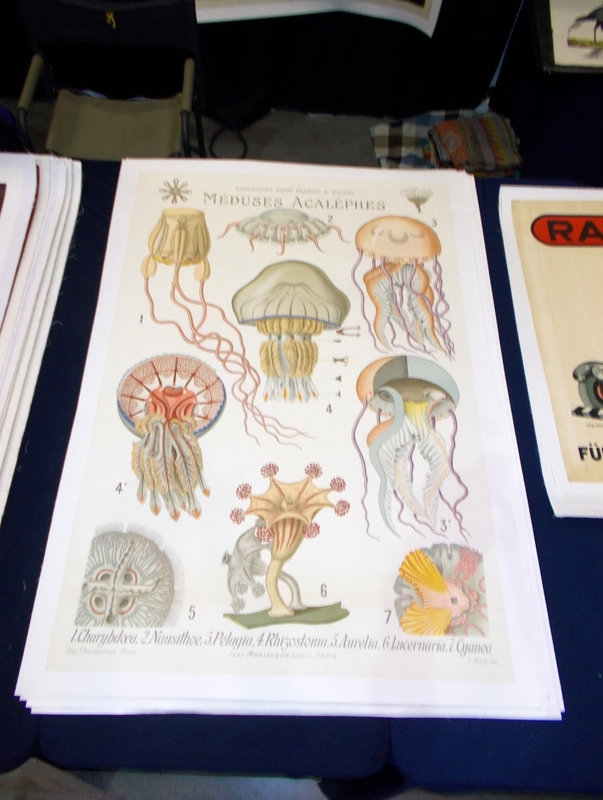 He specializes in late Nineteenth and Twentieth Century advertising, which he says is currently very hot. 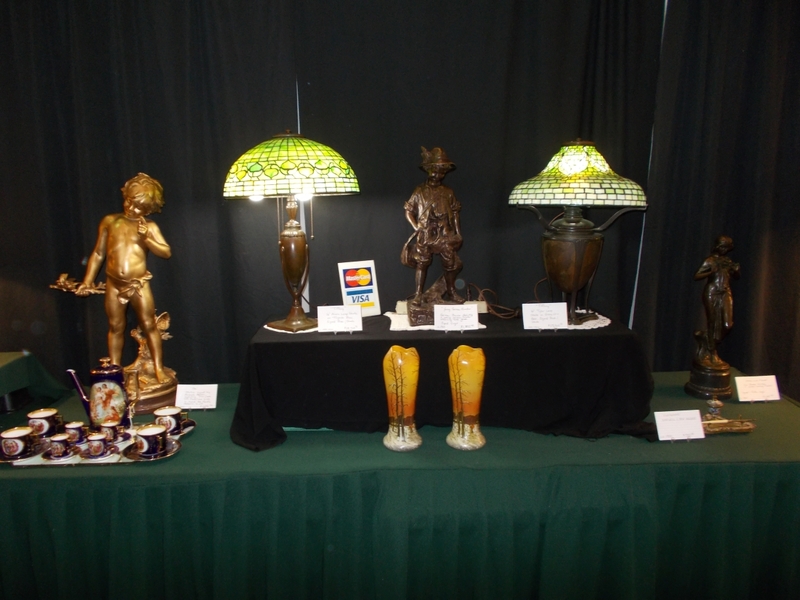 His display was a double booth overflowing with examples of these pieces from the last 125 years, which sold well. 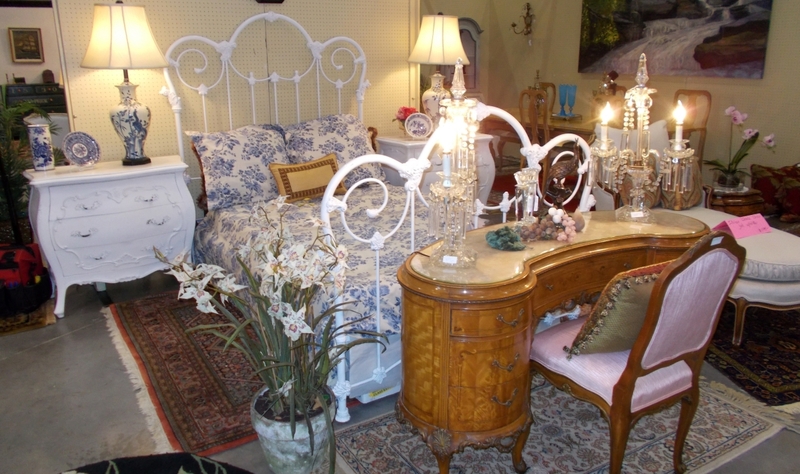 Sharon Green Antiques, Sharon Conn. Simpler Times Antiques from Williamsburg, Va., sold small furniture on the first day, including two candlestands they had brought. Both were 200-year-old American Hepplewhite examples, one in tiger maple, the other in cherry. 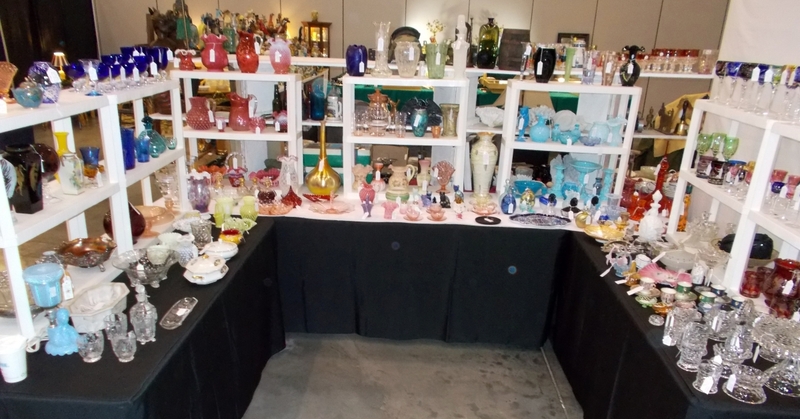 From Sharon, Conn., Sharon Green Antiques was busy all weekend with the sale of the decorative “smalls.” Offering several showcases filled with unusual silver objects, there were sales of sterling silver swizzle sticks, sugar servers, perfume bottles and inkwells. A Nineteenth Century hand stitched quilt from Nebraska with applique work in a flower basket design sold on the first day. David McInturff and Homa Rouhani, Alexandria, Va., collect and trade in glass from the last 150 years. Their sales at this show were dominated by cut-to-clear European glass, which is glass with a colored exterior, but a cut design revealing clear glass. 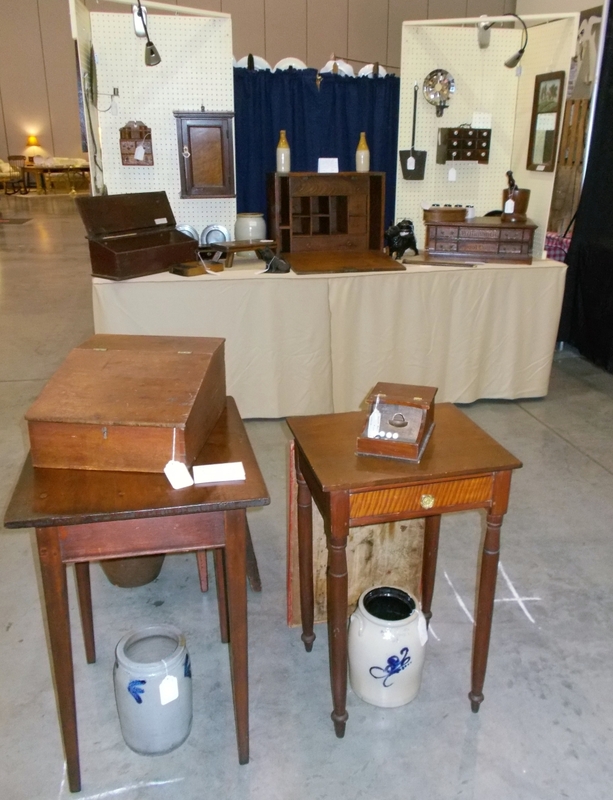 Shutter Door Antiques is a business in Virginia Beach, Va., that brought some of their furniture and jewelry inventory to the show. 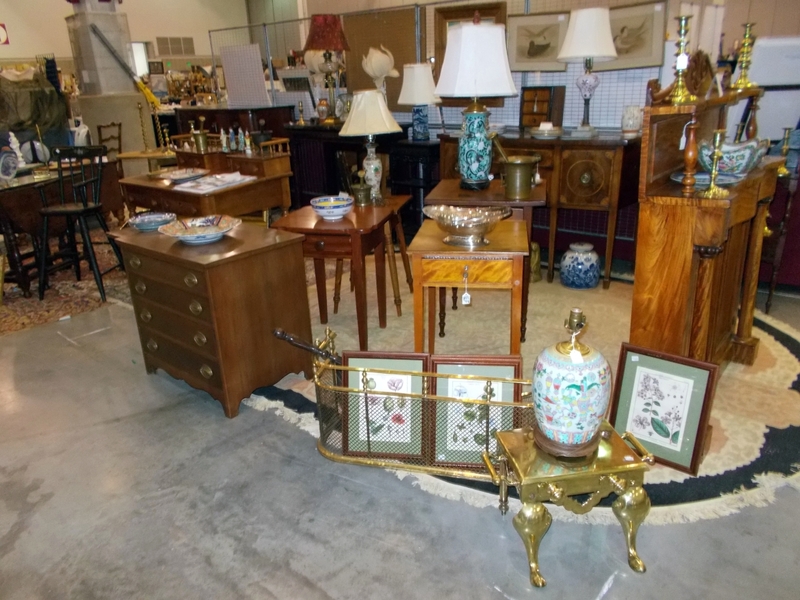 Antique, estate and later jewelry sold well, and mid Century furniture for the beach house. 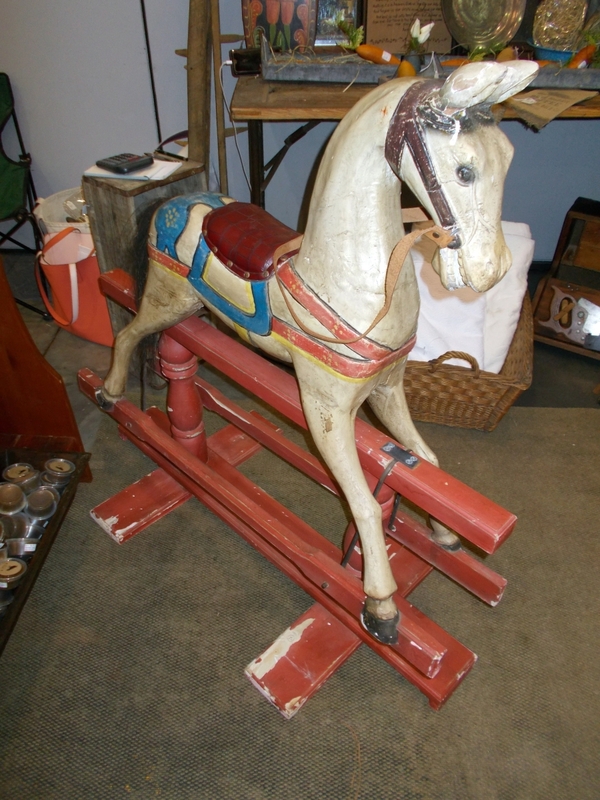 Boxwood Designs, also local to the area in Norfolk, Va., brought a charming rocking horse that had its original paint but a more recent leather saddle. The makers tag was missing but it was in otherwise very good condition. Owner Joanne Blandford said her sales were all smalls, including an early piece of stoneware, vintage wooden tools, chenille bedcovers for twin beds, vintage Easter eggs and an antique chicken feeder. 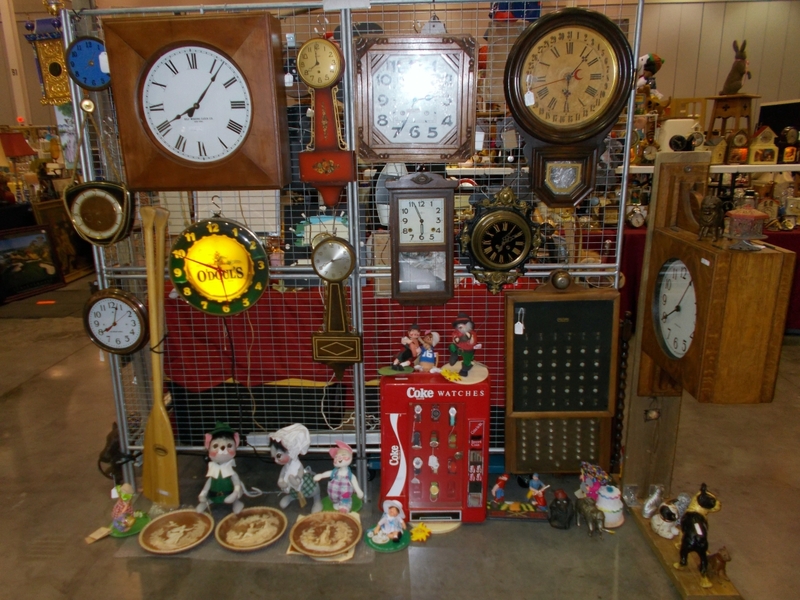 The McCloskeys from Lynbrook, N.Y., came with their clock collection. 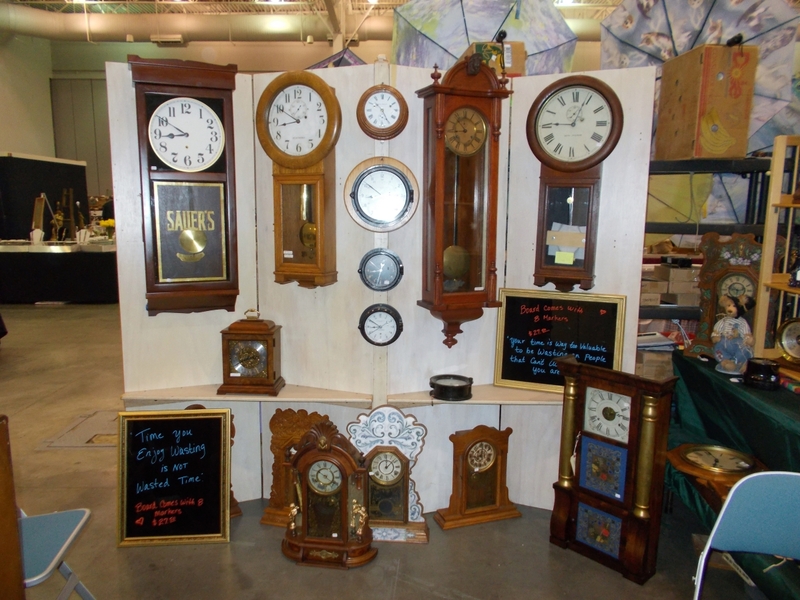 George does not just bring the early windup clocks; he also has novelty clocks from the first half of the Twentieth Century. These included the wagging tail black cat, the chubby baker and lots of advertising clocks, all in good working order. 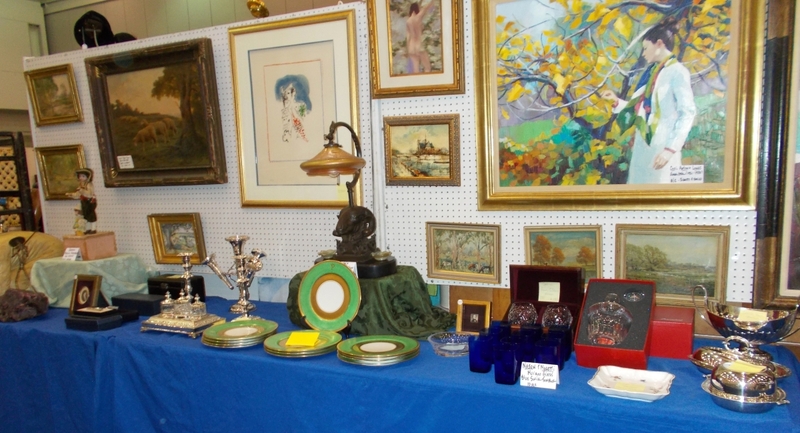 To advertise its services and sell, Premier Auction & Estate Services, Baltimore, Md., brought a collection of collectibles and advertising items. Marc Calciano, Clifton Heights, Penn. sold from his fine art and fine china collection. 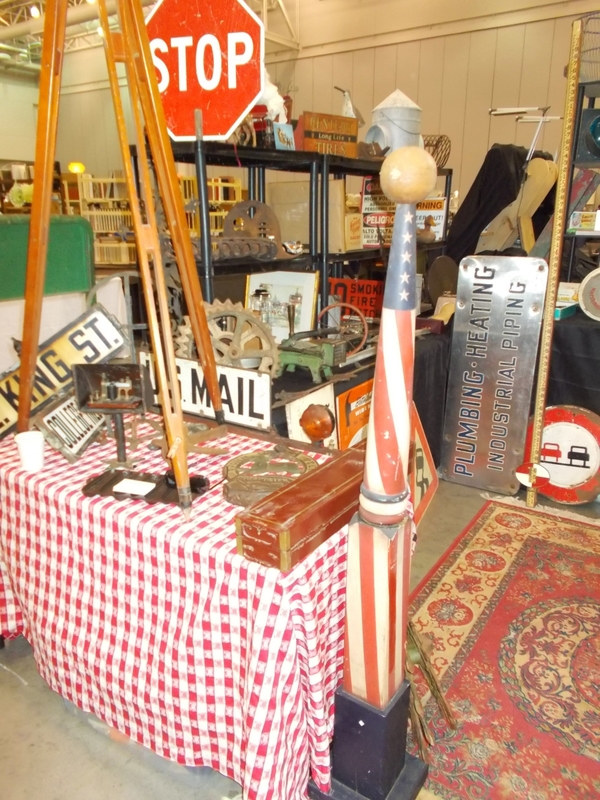 Joan Sides founded her business in the Hampton Roads area four decades ago with the first Big Flea Markets, then built them into the antiques and collectibles super shows they have now become. She said, “This show had a very good response for the dealers’ efforts. We are planning to resume our shows here at this facility, because it has just what we need: easy access for the shoppers, good free parking, hotels for the dealers and a market of more than three million people in the immediate vicinity.” Sides has not announced the date for the next Hampton show but late February 2020 is her plan. 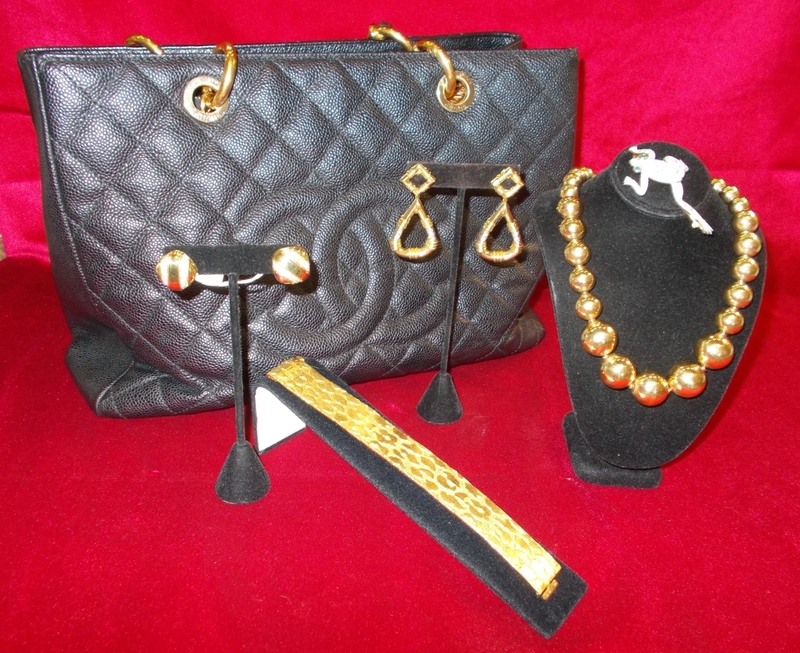 D’Amore’s next show is the DC Big Flea & Antiques Show, May 4-5, in Chantilly, Va. For information, 757-430-4735 or www.thebigfleamarket.com. The evaluation service WorthPoint was holding its Treasure Hunt with more than a dozen shoppers, including this group, from left, Jenna Sladky, Scot Wucher, Brigette Wucher, Judy Spencer and Rebecca Spivey in the back row and Roger Warf, Dana Crawford, the WorthPoint director, in the foreground.